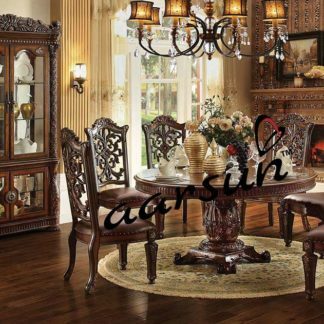 Aarsun Woods offers to you handcrafted wooden dining set made from premium quality wood by experienced craftsman. A traditional style dining set that features one round dining table, and four side chairs with slatted bent-back frame. It is finished in natural Walnut color. The natural wood finish color is an elegant touch and a stylish addition to your dining room decor. The wooden dining set have floral carving. A wooden table is transformed with a classic finish and modern contemporary chairs.